Today I'll be sharing with you my very last Ipsy Glam Bag. Yup it's true, after about 3 years I've decided to cancel my Ipsy subscription. I just haven't been excited for many of the products that they were including in the bags. Anyways, let's get started! Ipsy is a monthly beauty subscription service. For just $10 you get 4-6 deluxe sample size or full size beauty products. These items are typically hair, skincare, and makeup products. They can range from high end to affordable brands. Everything comes in a pretty makeup bag that is different each month. The theme for this month's bag is Alter Ego. 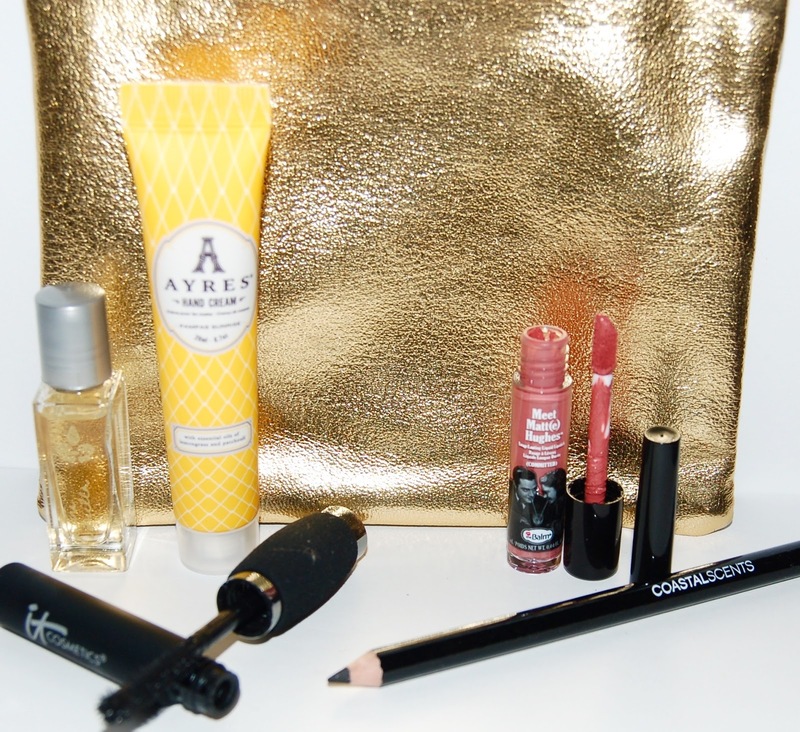 The makeup bag this month is metallic gold on one side and shiny black on the other. I don't love getting perfume samples in my beauty subscriptions but at least this a deluxe rollerball size. It has a very woodsy vanilla scent. This is a very light hand cream that will be nice to keep in my desk at work. It has an herbal-type scent that reminds me of Aveda products. Since I have about a million black eyeliners I'll be passing this one along. I was excited to see this high end product in my bag! The brush is very unique with a ball detailer at the end to really get those inner lashes. I was excited to see this product in my bag too since liquid lipsticks are insanely popular right now and this is a high end brand. The formula is one of my favorites and it isn't drying. Not to mention that it smells like peppermint and vanilla! This month's Ipsy Glam bag was one of my favorites of the last several months...go figure that it happens to be my last one! :) That's ok though I still have Boxycharm and now my Play By Sephora box. What's your favorite beauty subscription service?